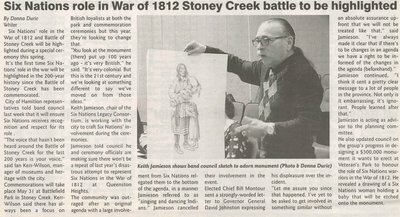 "Six Nations' role in the War of 1812 and Battle of Stoney Creek will be highlighted during a special ceremony this spring." Kerr-Wilson, Ian ; Jamieson, Keith ; Montour, Bill ; Johnston, David. City of Hamilton ; Six Nations Legacy Consortium.